Snorkel in crystal clear water usually waist or chest deep over pristine grass flats and bag your limit of these delicious shellfish. 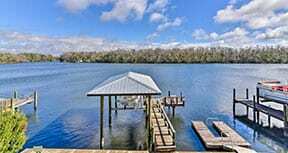 Some clients will book an entire day and spend the morning scalloping and the afternoon swimming in the crystal clear spring water at the beginning of the Homosassa River. 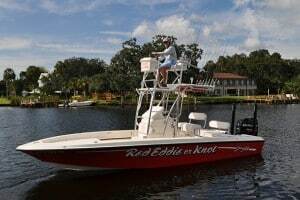 Our new custom Young 24 has a smooth comfortable dry ride and can easily accommodate four to six divers. 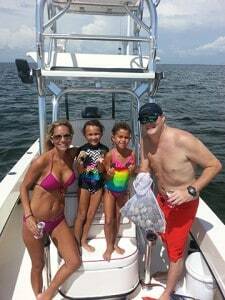 Why not scallop from the nicest, sleekest, fastest, coolest, and classiest charter boat in all of Citrus County! Or our newly renovated custom Carolina Skiff, (floating barge), can comfortably handle six diver’s and both boats are equipped with a ladder for your convenience. All it takes is a snorkel, a mask and a mesh bag to get in on the action. Cleaning of scallops is available dockside. We supply license, coolers, ice and expert instructions, in and out of the water. What you’ll need to bring is snorkel, mask, fins, drinks, food, and sun protection, (hat, t-shirt, lotion, sunglasses). Homosassa scallop tours cost $350.00, for one to four people for a half day adventure and $75.00 for each additional person up to six people. We do two Scallop charters per day, the morning charter is from 7 to 11AM, and the afternoon charter is from Noon until 4PM. We highly recommend the morning charters for a few reasons, fewer boats so it’s not as crowded and much safer, (especially weekends), it’s not as hot and less chance of summertime thunderstorms. 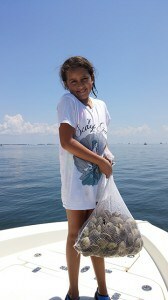 We have perfected the technique of catching Scallops in Homosassa, and over the last few seasons, we usually catch our limit of scallops within two hours! We have many clients that return year after year to enjoy what is best described as an “Underwater Easter Egg Hunt”!! Call 352-382-3939 or click to reserve your scallop charter on the “RED” hottest boat in Old Homosassa!! !